Cal Poly Interfraternity Council (IFC) chapter presidents voted to place all IFC chapters on probation until further notice. 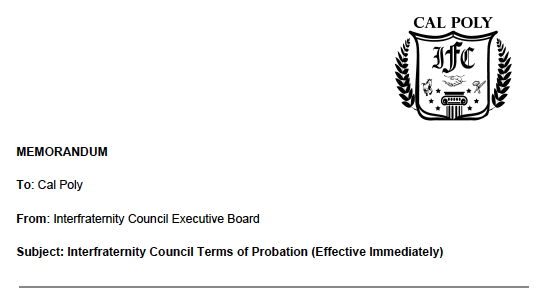 IFC has voluntarily placed themselves on probation. This is in response to a racist photo of a Lambda Chi Alpha member wearing blackface that surfaced earlier this week. The IFC Executive Board, along with chapter presidents, will implement and carry out a plan of action during the probation period, which will be released April 20. “We want to acknowledge our role in contributing to an environment that perpetuates racism, and are making a commitment from this day forward to hold our community more responsible and hold them accountable to the values we strive by,” the press release said. 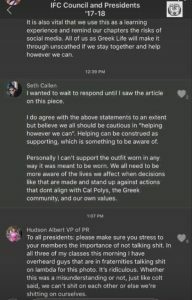 A group text between the IFC Council and Presidents ’17-18 was leaked and posted on a Facebook page. 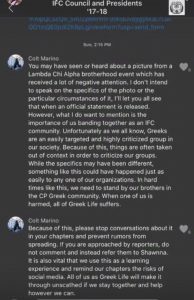 IFC President Colton Marino said he will not be speaking on the specifics of the photo. “However, what I do want to mention is the importance of us banding together as an IFC community,” Marino wrote. At the student forum put on by the president, the Office of University Diversity & Inclusion and Student Affairs tonight, President Jeffrey Armstrong said Panhellenic is voting on whether or not sororities will be put on social probation.